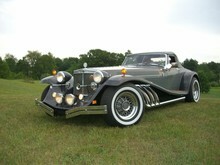 In 1975 Clénet Coachworks Inc. was formed by Alain Clenet and investors. Originally started in a garage, the company was moved into an airplane hangar where an assembly line style of production was begun, later to be reborn in a "high tech" facility in Goleta, California (just north of Santa Barbara) where production of Series II and Series III (Asha) were produced until the company ran into financial difficulties in the early 1980s, ceased production, and filed for bankruptcy. The remaining bodies, tooling and equipment went up for auction. John F George, owner of the last "Series I" (250/250) financed the purchased the assets of Clenet Coachworks Inc. and revived Clenet and moved the company to a new production factory in Carpinteria, California. Alfred J. DiMora became a partner in the new corporation, and named as President, re-established the production of the automobile to the same standards of the original and utilizing many of the original craftsmen from first Clénet company, production resumed on the two series of Clenets started at the Goleta facility. Later adding the Ser IV to the line of Clenets. Clénet Coachworks automobiles offered features such as Italian walnut burl dashboards and etched glass accented by Waterford crystal ashtrays which brought many Clenet models in at over $100,000. Buyers ranged from Farrah Fawcett, Rod Stewart, Ken Norton, and Sylvester Stallone to King Hussein of Jordan to name a few. 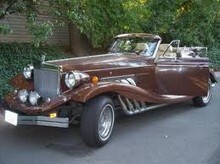 Clénets were called "Drive Art" by Automotive Age and the "American Rolls-Royce" by Fortune. The new Clénet was selected as the Official Centennial Car in 1986, the year that President Ronald Reagan declared the Centennial Year of the Gasoline-Powered Automobile. As a result, Clénet Coachworks was honored at the Automotive Hall of Fame in Michigan. 250 Factory Authorized, Clénet Series One, 187 Series Two, 65 Series Three and 15 Series Four cars were produced by Clenet Coachworks Inc. Clenets sold for around US$70,000 in the 1970s. Recently Clénets in great or new condition with no mileage on them have sold for US$100,000 to $150,000.